The specific performance characteristics of current and voltage instrument transformers are easily determined from the equivalent circuit. Figure 1 works well for most instrument transformers. For current transformers, the value of the reactance X is determined in a special way so that it represents the leakage flux. The flux flows in the part of the core represented by the left-hand exciting branch of the equivalent circuit shown in Figure 1. 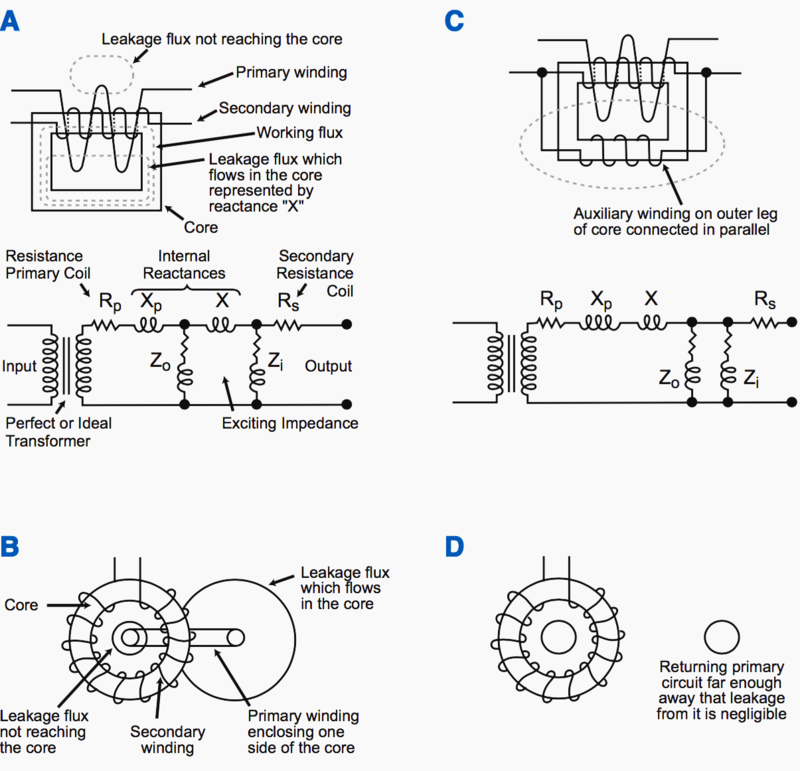 An additional winding (or windings) placed over the outer leg(s) of the core and connected back in parallel with the secondary winding, as shown in Figure 4, can keep the leakage flux out of the core. The leakage reactance is then effectively connected ahead of both exciting branches as shown in Figure 1. This difference is important for current transformers because leakage flux in the core affects current ratio. 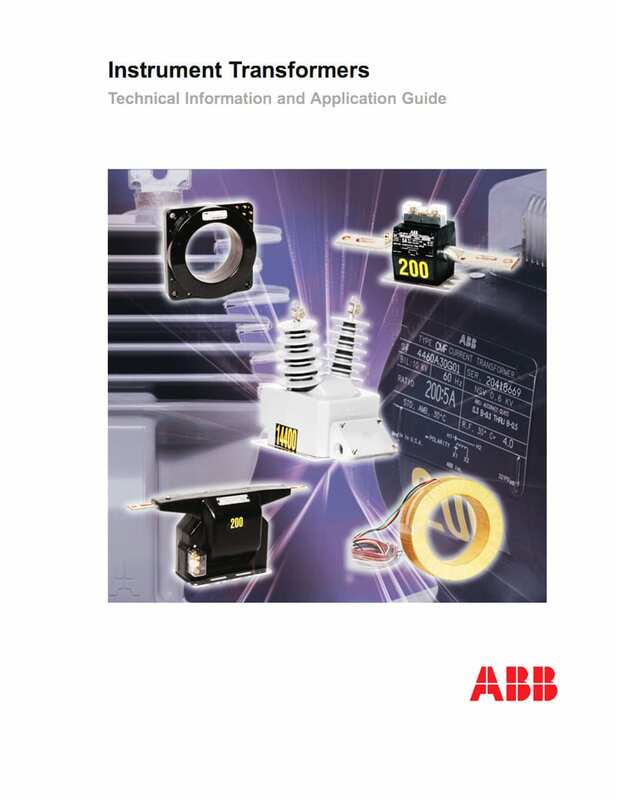 It also improves the performance of current transformers and subjects their performance to simple calculation. Voltage transformers are designed so the through impedance (RS, R, XP, and X) is as low as possible, while current transformers are designed so the excitation impedance (Zo and Zi) is as high as possible. Neither transformer is very good at performing the function of the other. The leakage flux is shown entering the outer part of the core and is represented by reactance X. The reactance develops voltage applied to the exciting branch Zo, which represents the outer side of the core. The series impedance, RP + RS + j (XP + X), is responsible for the loss of voltage in transformation. The voltage transformers are carefully designed to keep this impedance as low as possible. The loss of current in transformation is due to current by-passed by the exciting branches, Zo and Zi. 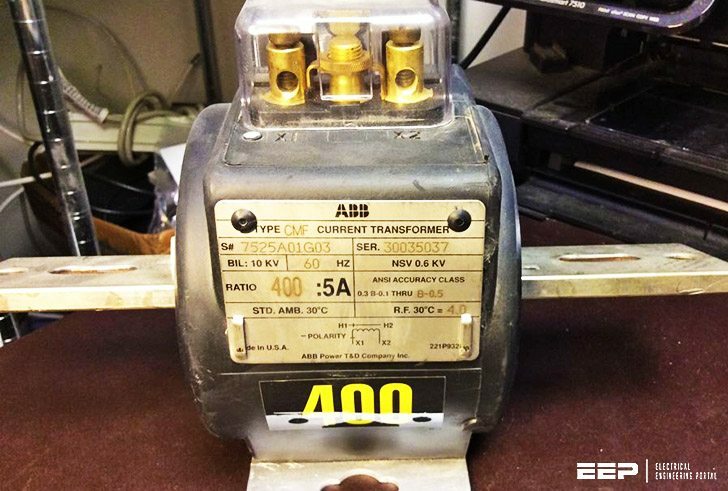 Current transformers are specially designed to keep these by-pass exciting impedances as high as possible. Leakage flux enters the core even though the winding is uniformly wound over a ring core. The equivalent circuit is the same as for Figure A. The parallel auxiliary winding effectively keeps the leakage flux out of the core so that the leakage reactance in the equivalent circuit is effectively ahead of the exciting branches. This simplifies the calculation of the current by-passed through Zo and Zi. This resembles the transformer in B but has only negligible leakage flux in the core because the return conductor is far away. This transformer still has a good deal of leakage reactance, but the leakage flux does not enter the core in significant amount. The reactance is ahead of the by-pass branches Zo and Zi so that the performance as a current transformer can be easily calculated.